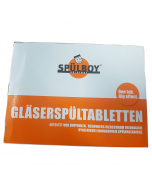 Spulboy brush glass washers are well established in the German market, selling well over 5 million units across 30 years operation. Recently, they have been making a revolutionary entry to the UK market. 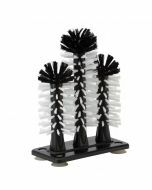 Portable, economical & effective the Spulboy brush glass washing system removes lipstick & grease easily. 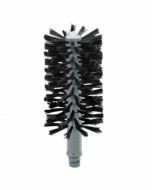 They are ideal as a back-up or additional washing capability during exceptionally busy periods. You can also wash all glasses including handle and foot up to a depth of 24CM. 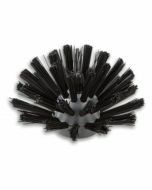 The major benefit of this new Twin-Go T brush glass washer is that it is completely portable. 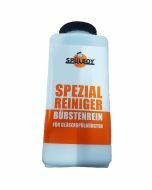 Unlike the traditional model the two cylinder design enables glass cleaning without the Spulboy needing to be in a sink. It is flexible for use anywhere, even outdoors. 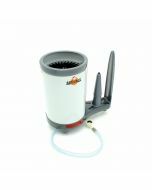 Working only with water pressure, they are fast and easy to handle, saving a large ammount of water and space. 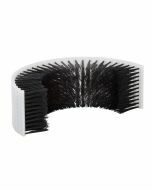 Glasses are washed mechanically in a pre-wash container with interior and exterior brushes. Every glass is rinsed with fresh water. The patented 2-level valve ensures water is only used when rinsing is activated. Fresh water also runs in the pre-wash container parallel to the rinsing of the glass, thus ensuring contestant fresh water supply. If you really want to enjoy a beer, a clean glass plays a decisive role. The remenants of other drinks, aggressive cleaning liquids or even lipstick traces will spoil the pure taste of the beer. A crystal-clear glass is also the hallmark of hygiene in a pub and is certainly always good advertising for the pub-owner. The Original Spulboy guarantees a perfect washing result. All glass types, all bitter glasses and even wine glasses are washed perfectly and the guests can enjoy the taste of pure beer and clean glasses.